Assembling the perfect set of dive gear took me years. Every time I saw a woman who had something great, I asked her about it, then went home and bought what she loved. That’s what gear is all about. Trial-and-error. Talking about gear with women who’ve tried a lot of it. 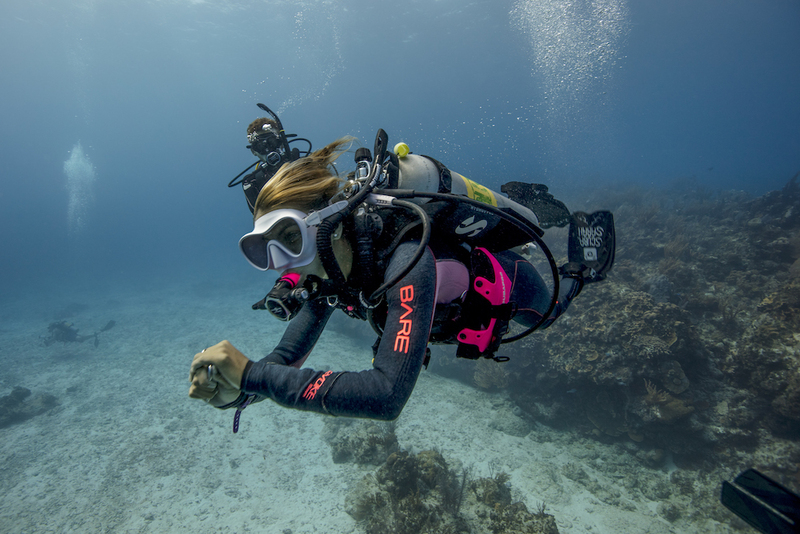 Making discoveries on dive trips, seeing which dive gear is working best for other women. 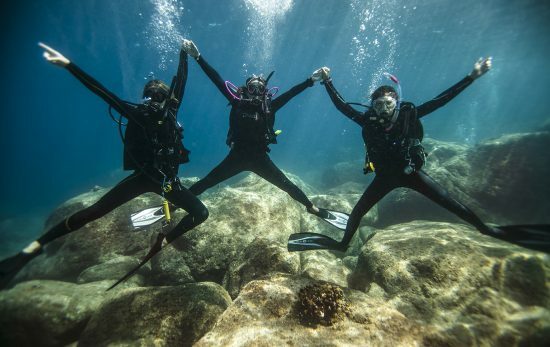 Because scuba gear isn’t one-size-fits-all, especially for women. It’s about finding the pieces that give you the most comfort, security and style. 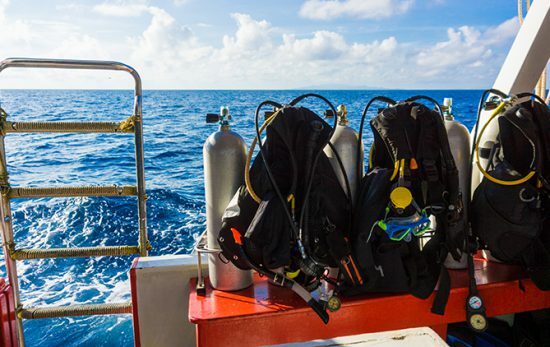 Here are five pieces that I’ve found I can’t dive without. A woman’s BC sits higher on the waist to accommodate the hips, thus eliminating the friction that men’s BCs can often cause when sitting too low on the body. They are sized smaller, which means we can cinch them down so they fit properly. Those with integrated weights mean there’s no need to wear a weight belt, which tends to ride up on women as we invert or move in the water. Some styles even offer a bra-like layer for additional support. Women who want a “fun” wetsuit can turn to surf brands, such as Body Glove and Roxy, which craft wetsuits with patterns, pops of color and a host of style options. I love the 3/2mm Synchro Plus Chest Zip suit for its blue and pink coloring, and styling that flatters the female form. When we log three to five dives a day, we need layers. I like adding a vest for warmth, and I prefer mine without a hood (otherwise, with a vest that comes with a hood, you have to wear the hood or have it bunched up around your neck, which just looks and feels awkward). Note: Henderson offers just such a product in sizes 4 to 14. I always pack a rash guard on every dive trip for two reasons: It adds warmth under the wetsuit. And, second, it makes the wetsuit easier to slip into. Plus, if you’re going to snorkel on your trip or enjoy beach time, a rash guard eliminates the need for sun block. Yes, masks are unisex, but that doesn’t mean what works for him is always going to fit best for her. I like the Atomic Frameless mask in clear because it disappears the most on the face in photos. 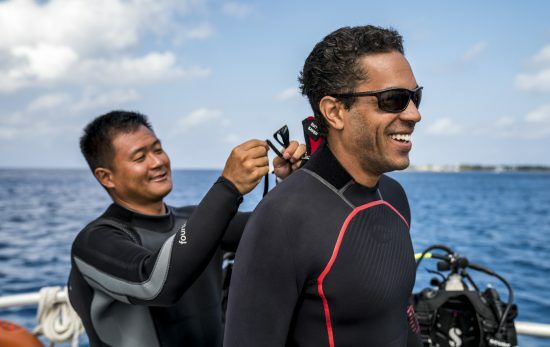 If you teach scuba and are on the surface a lot, you might prefer it in black to keep the sun out. Plus, they make the mask in two sizes: Regular/standard and medium. The medium size fits smaller, narrower faces—which women often have. Let’s face it—sooner or later, every diver needs a hood because it’s cold out there! Terrapin Wetsuits has the largest offering of fun, colorful hoods—everything from a yellow-and-blue nudibranch to a clownfish to ladybug to Hello Kitty. Why not have a little fun? After all, if you’re like me, you spend at least 30 minutes picking out your outfit, so may as well extend your underwater accessories, too. Plus, having a giant neoprene nudibranch on your head makes you easy to spot in a group of divers, so it’s a safety thing, too. 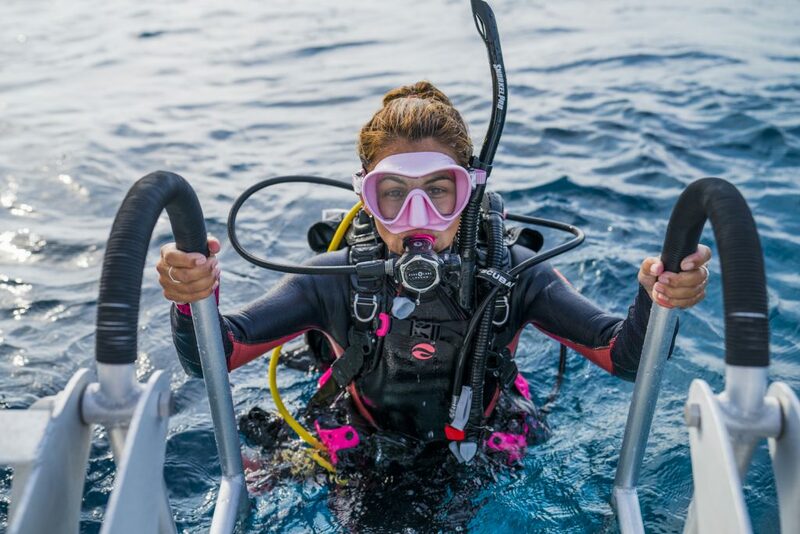 Don’t forget, PADI Women’s Dive Day is July 21st! Find an event here.